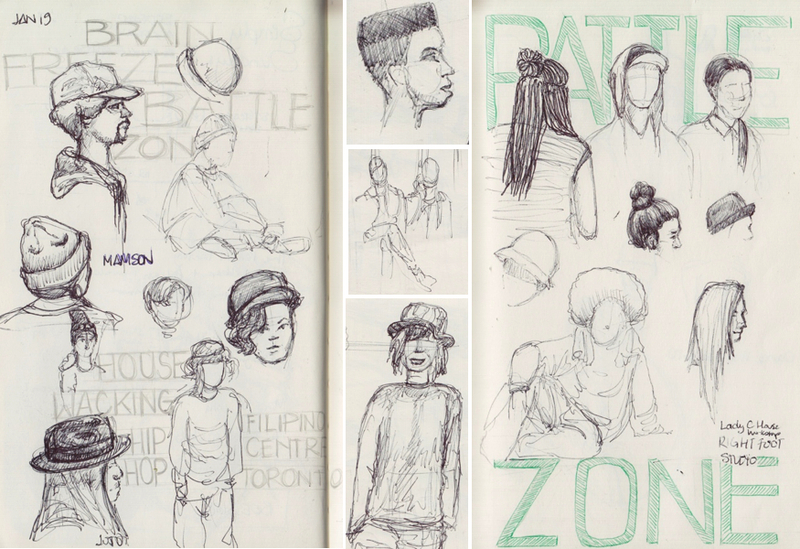 Last Sunday I attended the Brain Freeze Battle Zone dance competition which took place in the basement of the Filipino Centre Toronto. During the event, I sketched a couple of the participants and judges. It was great to see all these people expressing themselves through music and coming up with clever ways to move their body, essentially materializing the music by painting a temporary picture with their gestures. It was fun to be able to witness this and to see how the dancers entertained the viewers, taunt their opponents and showed clever tricks and dance moves that made the viewers reacts with a lot of "oooohs" and "aaaahs". There's a lot of talented dancers out there from all walks of life and all ages. As usual, there was a great atmosphere of camaraderie, fun, love of music and support for one another. It's great to see events like this in the city.